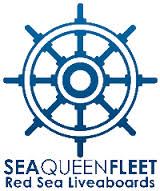 Founded in 1993, Sea Queen Fleet is a well established Registered Shareholding Company with five partners: three Egyptians, a Spaniard and a Dutch. Over the years the Company has grown and now flourishes. Starting out with just one liveaboard boat, today the fleet numbers four boats and clients come from all corners of the world to dive with the Sea Queen Fleet. About 60 people work on the boats, in the branches in Sharm el Sheikh and Hurghada and in the Cairo office, seeking a high standard of operation and service to our clients .